• Identify the location of fire hydrants, railroad transmission boxes, and other vital outdoor fixed equipment. Flexible 6' fiberglass rod (3/8" diameter) carries 5" x 4" flag. Both are decorated with reflective red and white stripes for high visibility day or night. Base of rod is fitted with heavy duty steel spring and mounting bracket to accept 5/8" diameter bolt. Hydrant Flag stands up to gale force winds and snaps right back up struck by snow plows or other vehicles. 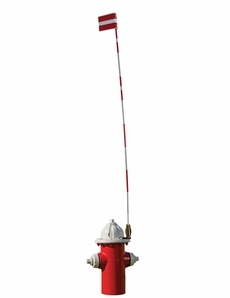 • Specify hydrant-mounting bracket or box-mounting bracket.